The best MMA sparring glove on the market today! Many top UFC stars have already converted to this glove. Built like a competition glove, this sparring glove has 7 ounces of gel padding which instantly molds to your hands. Created so you can train all day, every day, this 100% Softech™ Leather glove offers the most protection while training, without being restrictive to MMA movements. Shape and size of glove allow you to wear hand wraps underneath. Double lightweight RAM-Force™ technology padding covers first and second knuckles, hand, and thumb providing maximum protection, even for your middle knuckles. Double padding on top of the hand is split by stitching to decrease hand fatigue. Soft interior lining prevents skin irritation during long hours of use. Extra wrist wrapping protection against scratching you or your opponent while grappling. We proudly offer a huge variety of combat sports equipment for MMA practitioners, including our Revgear Pro Elastic Hand Wraps, Spartan Pro III Fight Shorts and Defender Gel Shin Guards. Take your MMA training to the next level with the most trusted and innovative source, Revgear. For assistance with your order, please feel free to call our helpful experts at 800-767-8288 or message us online for a fast response via email. Place your order with full confidence today. 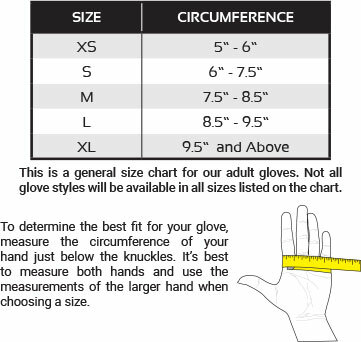 Size Chart Size: * XS - 5 oz. S - 6 oz. M - 6 oz. L - 7 oz. XL - 7 oz.